The parade was founded in 1998 by Jake Peppers. Through his experiences operating the Hula Bowl, Jake realized the need for a holiday parade in Honolulu and in partnership with Gateway Music Festivals & Tours, revived the Honolulu Christmas Parade, which had been dormant for several years. It was Jake Pepper’s passion for connecting with people that inspired and drove him to build the Waikiki Holiday Parade, a ‘Hui Ana’ (gathering) of Bands. 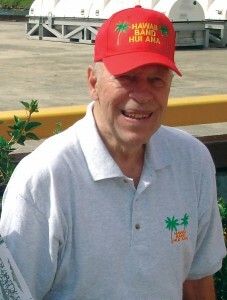 Jake first connected with marching bands and parades in the 1990’s through his work with the University of Hawaii’s Hula Bowl. Jake ran the Hula Bowl for several years, building the event by incorporating outrigger canoe regattas and races, golf and tennis tournaments and, yes, you guessed it, a parade. In his younger days, Jake played football at Maryville College near Townsend, Tennessee and served in the U.S. Navy overseas from 1956-1959. Jake always stressed the importance of this event as it gives students first-hand exposure to military heroes, new cultures and opens them up to traveling in the future. Whether you talked to Jake once, or more likely 20 times, you had a new friend for life. Jake loved his life and his work. We’ve never worked alongside anyone as passionate about our great country, the state of Hawaii and honoring our nation’s veterans, especially Pearl Harbor Survivors. His passion was evident as he watched each performance with teary eyes at Pearl Harbor and in the Waikiki Holiday Parade. We continue to carry on the tradition of the Waikiki Holiday Parade under the strict guidelines that Jake would expect.